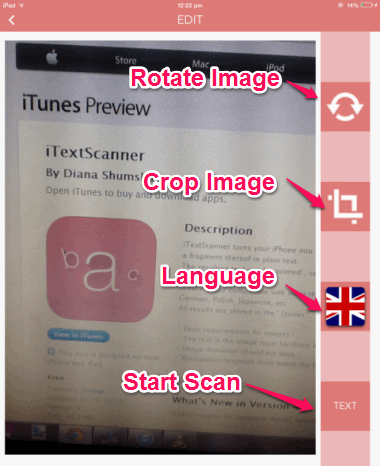 iTextScanner is a free iPad text scanner app which lets you extract texts from image and share them with others via different sharing mediums. You can extract texts from either existing photos or click a new photo and extract text from that. This OCR app for iPad is pretty simple to use and straightforward when it comes to performance. It directly delivers what it says, with no additional add-ons or ads to spoil user-experience. The app comes pre-loaded with English and Russian language, while you can purchase other languages via in-app purchases ($0.99 per language). Some of the languages are: African, German, Spanish, French, Icelandic, Indonesian, Italian, Polish, etc.. While extracting the text from image, you can also crop the image for focusing on the text only. When you have scanned the image, then you can share the text via email, Facebook, Twitter, Dropbox, Google Drive, Copy to clipboard, Wibeo, and different other mediums. The app also keeps a history of texts scanned by you so that you can access them directly, without scanning same text again and again. We recently covered a similar software for PC to extract text from JPG images. This app is its equivalent for iPad. Note: The scanning results vary with image quality, font size, distortion, etc..
As I mentioned earlier, this app is really simple to use. You don’t need to register with the app. Just launch the app to get the home screen. 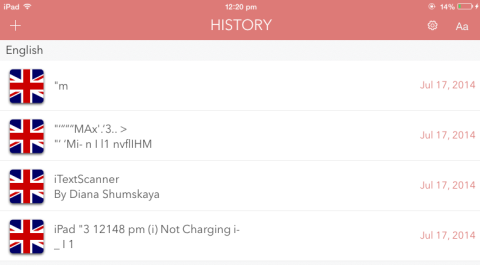 The home screen of the app has 4 options: Scan New Text (+ icon), History, Settings, and Language. Whenever you launch the app, it automatically opens up on History option interface. For first time users it will be blank White screen, but as you start using the app, the app will start displaying the texts scanned by you. To scan a new text, tap on the plus icon at top right. It will ask you to choose: Camera or Gallery. Choose the option you want to use and import photo. After importing the photo, you will see Edit screen (see the first screenshot). From here, you can rotate and crop photo along with selecting language. Just remember, you have to select same language in which the text you are scanning is written. Now, tap on Text option to start the scanning process. After successful scanning, you will see the text on the screen. Now, tap on icon at top right corner for sharing options. You can choose the method you like. 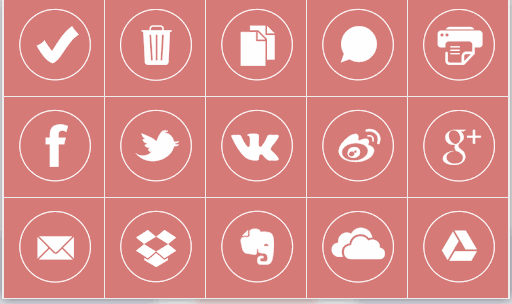 During my testing, the app shared the text perfectly for all mediums, except Google Drive and Dropbox. In these two mediums, the app converted the text to PDF and shared it. But when I opened my Google Drive and Dropbox account, I found that the PDF had garbled text. So to avoid it, you can copy the text to clipboard and then save it on some note making app for iPad. Now, convert that file to PDF and upload to your account. This way you can use this iPad text scanner app to scan texts from images and share them with others. You may also like to read: 5 free OCR Software. iTextScanner is a pretty handy iPad OCR app to extract texts from image. The app really worked fine, except that small glitch about garbled text in Dropbox and Google Drive. Other than that, it’s a really useful app.